I'm Tamaki Shun'ichi. I'm seventeen years old and in the third year of Okinawa Prefectural Haebaru High School. Up to the end of junior high, I lived on a small island called Izenajima in the northern part of Okinawa prefecture. 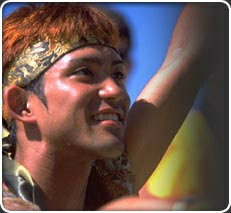 At the moment I'm studying Okinawan history and performing arts at a high school on the main island of Okinawa. I love music; I play the Japanese taiko drum, the guitar, and the sanshin and also write my own music and song lyrics. In the future I want to be a singer-songwriter and make music in a style uniquely my own.